Broadcast here March 7th, 10-11:00 a.m. Central (1500 GMT). For only $3.95 a month you can listen to shows on-demand before they are broadcast – and also get free downloads and other perks from Kevin! If you are a subscriber, just log in to the members area of TruthJihad.com to get early access to the shows. Non-subscribers only get access to the No Lies Radio show archives the day after the broadcast here. Help Kevin keep these shows on the air – become a subscriber today! 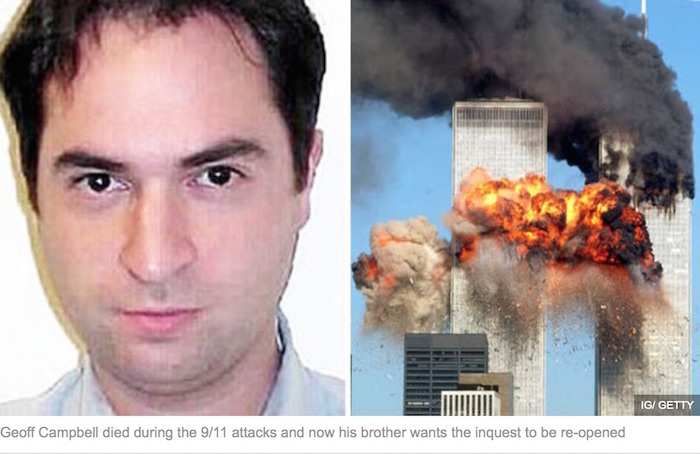 The Sunday Express interviewed Matt Campbell – who is seeking a new investigation into the death of his brother in the 9/11 attacks – under the headline Brother of Briton murdered during 9/11 attacks calls for inquest to be re-opened.The report in the Express emphasised the lack of hard evidence produced to support the official account of how suicide hijackers took America by surprise and flew two planes into the World Trade Center and a third into Pentagon.